Product #46343 | SKU SIRUI-N2004 | 0.0 (no ratings yet) Thanks for your rating! The Sirui N-2004 4-Section Aluminum Tripod is a great tripod for travelers and other adventurous photographers who need to pack light and reserve the option to, at a moment's notice, slim down their camera's support system to just a monopod. The N-2004 features a leg that unscrews and attaches to a second included mounting plate and, optionally, the tripod's removable center column, to form a monopod that ranges from 43 cm (collapsed) to 168 cm long (with the center column attached). Reaching a maximum height of 165cm, the tripod itself is quite versatile in its own right – the N-2004 weighs just 1.5 kg but supports up to 15 kg thanks to its thick upper leg sections and forged aluminium construction. It's suitable for use with just about any head and any 35mm camera, DSLR, point & shoot, or camcorder. 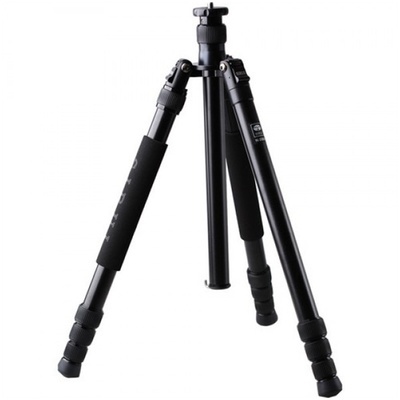 The compact N-2004 tripod's legs fold upward 180° to achieve a relatively compact folded length of 46cm – even with many camera head models attached. The entire package stays very compact to fit comfortably in most carry-on bags and many backpacks. The tripod's centre column is reversible, and the N-2004 comes with a short centre column so that you can set up extremely close to the ground for ultra-low-angle shooting. With the short centre column installed, you can set the legs at their wide angle (80°) and shoot from only 17 cm from the ground.